On Tuesday at midday, FC Barcelona goalkeeper Marc-André ter Stegen came to the Club’s offices to sign a contract extension that will keep him at Barça until June 30th. 2022. 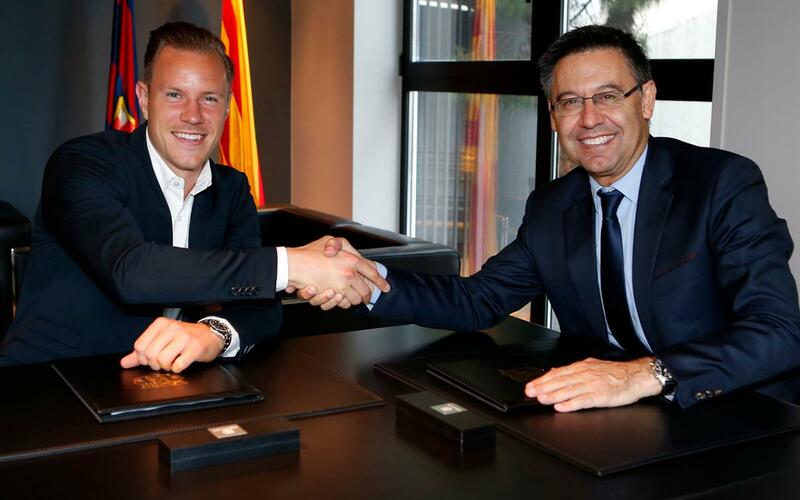 Ter Stegen was accompanied by FCB President Josep Maria Bartomeu to formalize the deal, which will keep Barça’s number one goalkeeper in Blaugrana for at least five more seasons. Ter Stegen closed out the 2016/17 season with the Copa del Rey title, his ninth since joining Barça before the 2014/15 season. Ter Stegen made 93 appearances under outgoing manager Luis Enrique, becoming a key player for the team. Ter Stegen’s honors include two league titles, three Copas del Rey, one Champions League, one Club World Cup, one Spanish Super Cup and one European Super Cup.